Miss my wrap-up/review last week? You can find it here! Following the resolution of Tomoe Koga’s time-altering Adolescence Syndrome, Sakuta looks forward to spending more quality time with Mai as the Summer continues on. He’s rattled, however, when he and Mai encounter a younger girl who shares the name (and face) of his first crush: Shoko Makinohara. Rescuing a small, sickly cat from the rain, Sakuta is temporarily charged with watching over it as Shoko navigates getting her parents permission to keep it. Despite the significant impact Shoko had on his life, she seems to have completely forgotten who he is. With no siblings to speak of, it’s likely that Adolescence Syndrome is at play here – but to what extent, we have yet to find out. Meanwhile, Sakuta’s been feeling a bit dejected since Mai hasn’t been in touch with him at all since leaving for work. His spirits are remedied quickly, however, when Mai comes home a day early and surprises him at the restaurant where he works. She apologizes for being a bad girlfriend, and even concedes that she’d “make it up to him”. His sophomore-mind immediately rushes to the very places you’d expect. While the early sub-plots are entertaining, the crux of the drama rests with the intellectual Rio Futaba. After Sakuta notices some odd behavior of hers at school, he later finds that there are two Futabas running around! After encountering one Futaba in a net café while on the phone with the other Futaba, Sakuta does his best to support his rattled friend, offering her a place to stay. Mai is initially opposed, but decides that the best solution is to stay with him as well. Once everyone’s peacefully gone to sleep, Mai returns from her house and lays down next to Sakuta. The two exchange some loaded banter on the floor before Sakuta attempts to make a move and kiss her. Unfortunately, it’s botched as he accidentally headbutts her. Mai turns in for the night, leaving a frustrated (but elated) Sakuta to curse his fumbled opportunity. The next day, he has Mai stay at the house with Kaede, Shoko and Futaba #1 while he goes to the school to investigate the doppleganger. Discovering the second Futaba at school, the two have a frank discussion about what’s going on. While some might expect the secondary Futaba to be a “shell” or incomplete copy, she appears to be the genuine article. While Futaba #1 claims to be unsure as to why this is happening, Futaba #2 appears to have a grasp on what caused the divergence in the first place. 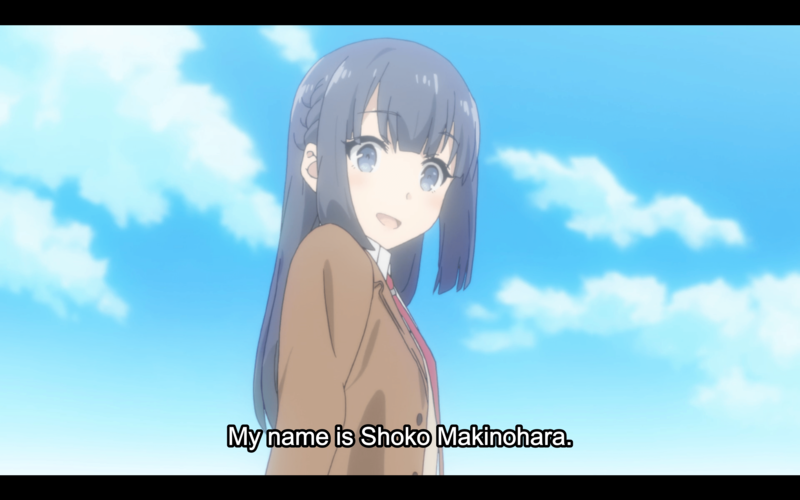 The episode ends with another female classmate approaching Sakuta about Futaba’s “risky” behavior, revealing a hidden account that appears to have some compromising pictures. In traditional fashion, the plot for the next arc is being meticulously built in this introductory episode. Futaba being the next student to experience adolescence syndrome is not quite karmic justice, but certainly ironic, seeing as she’s been incredulous about the phenomenon in general since the series began. I think that recognizing the allusions of each character’s adolescence syndrome so far (Mai’s disappearance, Koga’s time-loop) definitely suggests some of the possible reasons for Futaba’s twin-lives…especially with the revelation in the closing moments of the episode. I’m intrigued to see if my early predictions are correct in the weeks to come. Mai once again monopolizes the screen whenever she appears, simultaneously demonstrating some vulnerability as she seems sincerely apologetic to Sakuta for not calling him while she was away for work. Their dynamic continues to impress, and when all of these adolescence syndrome shenanigans are shaken out, I’d be perfectly content with a slice-of-life cour just focusing on their dating life. Arguably the most impactful scene in this episode is also the shortest: while Mai is hanging out with Futaba #1, Kaede and Shoko, her phone rings when her manager calls. Kaede hears the phone ring and her facial expression immediately contorts into one of anxiety and fear. Mai quickly apologizes, insisting that she thought it was on silent, and dashes outside to answer the phone. As viewers are aware, Kaede had a traumatic adolescence syndrome some years prior that involved cyber-bullying, and since then, neither Kaede or Sakuta have owned a personal cell phone. This momentary scene helps to communicate the gravity of adolescence syndrome for some, while simultaneously building respect for Mai (who empathizes and apologizes for the triggering circumstance) and Sakuta (who is committed to protecting his sister from her PTSD episodes by not owning a cell phone). I mentioned it in our podcast about a week ago, and I stick by this sentiment: I’m so glad that I picked up Rascal Does Not Dream Of Bunny Girl Senpai. I’m looking forward to seeing the revelations around Futaba, and the eventual resolution of her adolescence syndrome. Make sure to stay tuned!